A handsome solid wood Amish Dining Table can serve as the perfect centerpiece for your dining room. Our collection includes Double Pedestal, Leg, Single Base, Trestle and Pub tables featuring the classic Mission and Shaker design styles that are as popular now as they were a century ago. Choose the table that best meets your size requirements and enhances your dining room décor. If you’ve ever had the misfortune of purchasing flimsy, mass-produced furniture, then you’ll appreciate the quality and craftsmanship that goes into every Amish dining table, kitchen table and chair we sell. The Amish still make furniture the old-fashioned way: one piece at a time and completely by hand, while paying attention to the smallest details. All our solid wood tables and chairs are made from your choice of sturdy, durable northern kiln-dried hardwoods such as oak, cherry and maple to ensure they last a long time. How many people will be using my new real wood table and chairs? If you have a large family, you’re better off with one of our bigger, all-wood leg tables, such as the 60”-long Farmers Table w/ Drawer or the 66”-long Berkshire Table. What room will my Amish furniture tables be going in? If you’re furnishing a kitchen, then one of our pub tables could be all you need. But if you do need a larger dining table, other Amish furniture such as our trestle tables may be preferable. Is my dining room formal or informal? All of our Amish real-wood tables are attractive, but some are more formal than others. You may find a single-base table, such as the Williamson Table or Estate Oval Table, looks most elegant in your dining room. Always display flowers on your Amish table. Flowers keep a room bright and cheery. The ambiance of your room goes a long way toward making up for any interior design shortcomings. When you put out flowers, you’re ensuring smiles as soon as people enter the space. Find a signature tablecloth for your dining table made of solid wood. Tablecloths dress up any table and also help to protect your new purchase from stains and regular wear and tear. Find a tablecloth that pulls together style elements from your kitchen or dining room. Consider a rustic look to complement your solid wood table. All-wood kitchen and dining room tables naturally lend themselves to a rustic, woodsy look. Embrace that by decorating with mason jars, gingham and planter boxes. After you’ve selected a new dining room table, you may be wondering how it will fit in with your existing furniture. Sometimes a new piece can perfectly complement your older pieces, as long as you go with the same style. However, more often, you’ll find you need to get new furniture to go with what you’re adding. You don’t need everything to match exactly, but it’s critical to carry the same style throughout the room. For instance, you don’t want to mix modern and country, which would look odd. One way to ensure your furniture matches up is to buy a set instead of just an individual table. We sell solid wood kitchen and dining room table sets to make this process easier. Take a look at our selection of dining room or kitchen sets to see if the table you love comes with other furniture. Attractive, long-lasting furniture at discounted prices results in the best value for your furniture dollar. We offer a number of discounts that can save you a substantial amount of money. Purchase any table from our dining room collection right now and get up to 33% off the regular retail price! Save even more by adding chairs or other dining room accessories to take full advantage of our large order discount. You’ll even get an additional 3% off just for paying by check. 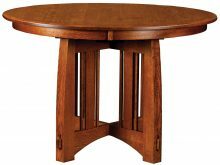 Browse our entire solid wood Amish Dining Table collection and place your order today!